There’s a lot to be said for buying a washer and dryer pair. They’ll be matchy-matchy not just in design and color, but in size and stackability, and the best combos talk to each other, making them wash and dry more effectively. But sometimes you fall in love with a washer and its accompanying dryer leaves you (or your clothes) cold. There are some things to keep in mind when buying a washer and dryer separately, namely the 1:2 ratio. You don’t want a washer so cavernous that your dryer can’t keep up, and you want to make sure both machines’ measurements are complementary. But maybe your dryer just died (you tried to fix it, right?) and your washer is still going strong, or maybe they’ll live in your unfinished basement and you couldn’t care less if one is pearl white and the other slate gray. We’ve put together a list of the best dryers and paired them with top matches from our list of the best washers you can buy. While we tried to keep price and capacity in mind, you’ll want to make sure the dimensions and color options work for you. Why you should buy this: This machine knows when to stop drying your clothes, making it gentle on fabrics. Though it may not have endless cycles, the Electrolux Front Load Dryer with Perfect Steam has a lot of ways to dry your clothes — or just refresh, sanitize, or get them nearly allergen-free. Sometimes an overwhelming amount of cycles isn’t a good thing; lots of people just stick to “normal” and vary the temperature based on what they’re drying. But this Electrolux has some you’ll want to pay attention to, like allergen (which cranks up the heat to kill dust mites), the 15-minute fast dry (for small loads), and instant refresh (which airs out clothes that are clean but less-than-fresh). Buttons to the side of the Nest-like dial let you add steam to get rid of wrinkles and static, as well as change the time, temperature, and spin-speed. Inside the drum, sensors keep track of how wet your clothes are, so you they don’t over-dry and harm the fabric. Electrolux also offers an impressive 10-year drive motor warranty. The 8.0-cubic-foot dryer is no doubt a luxury appliance, with a price tag to match, but you get space, steam, and germ-killing features. Best of all, its companion washer, the EFLS617SIW, is our pick for best washer. Why you should buy this: This machine is a giganotosaurus when it comes to capacity. With 8.8 cubic feet of capacity, this Maytag dryer with steam can hold a large load of laundry but also give it room to tumble around. Its removable drying rack gives you lots of versatility, letting you dry tangled items without knocking them around the drum — or maybe you don’t want clunky items like shoes doing a number on your machine. You get 11 cycles, including one especially for jeans, another for sanitizing, and a third that uses steam to refresh your lightly worn items. If you don’t want any heat, there’s an air-only option, and you can further control the temperature, dryness level, and wrinkle settings. If you’re looking to save some money (especially since this is a fairly pricey machine), there’s an Energy Saver button that extends the dryer time but lowers the heat. If you’re always leaving your laundry until you have a veritable clothes mountain, this Maytag dryer will be up to the task. Why you should buy this: This machine is a small but powerful compact. At 24 inches deep and wide, the 4.0-cubic-foot Electrolux compact is definitely easy to fit in tight spaces compared to full-sized machines. It lacks a vent, so it doesn’t require a duct to remove hot air, meaning that you have more options for placement. It’s 33.5 inches tall, so many people will still be able to reach the front-control panel if it’s stacked on top of a washer. The dryer has long dry times, as will any ventless dryer, but it does a thorough job. It has sensors that either lengthen or shorten drying time, depending on whether your clothes are still wet. With seven regular cycles and four specialty ones, including one for wool, this Electrolux gives you a fair amount of options. Compact machines are often pretty pricey, but this one has features that won’t make you feel like you’re getting ripped off for something that costs as much as a dryer with double the capacity. Why you should buy this: This behemoth can tackle lots of laundry scenarios. There’s no getting around that the Samsung FlexDry is big and spendy. But its extra bulk is for the dedicated Delicate Dryer, a space on top where you can lay sweaters and other items you wouldn’t normally toss in the tumbling drum. Lots of dryers let you insert a rack into the machine itself, but this Samsung model lets you leave the drum open for traditional loads while taking advantage of heated air. It never gets truly hot but still dries stuffed animals and clothing faster than letting them drip dry. In addition to the one-cubic-foot top compartment, the drum has 6.1 cubic feet of space. There are oodles of cycles, including sanitize options and one specifically for bedding. Using steam, you can increase the machine’s versatility with wrinkle-fighting and refresh cycles. The FlexDry also works with Samsung’s Smart Home app, so you can see if your load is finished without trekking down to the basement. If you have some items you absolutely refuse to toss in the dryer, this appliance just might change laundry day for you. Why you should buy this: With lots of pluses, the smart features are just a bonus. Who it’s for: Those who want a big, powerful dryer and think they could use some smart features, too. It’s not just smarts you’re paying for with this pricey LG dryer, but design. It’s almost $1,000 more than the Maytag mega-capacity but does have a smidge more room at 9.0 cubic feet. With its 14 cycles, there are a few ways to get clothes dry or do a quick steam refresh. It also has sanitize options if you prefer your fabrics germ-free. It even has a cycle that lets you disinfect non-washable items. What makes it so smart? The Wi-Fi-enabled dryer has a compatible app that can help diagnose any issues that arise. It can also take advantage of LG’s Smart Grid feature to save you a bit of money when energy costs are lower. It will also, of course, let you know when your clothes are dry. To us, it makes sense to pair a smart washer and dryer of the same brand in the hopes that they might one day talk to each other. Why you should buy this: With lots of capacity, this dryer gets the job done for half the price of many competitors. There’s no doubt the Maytag Large Capacity dryer is a no-frills, low-cost option. The list of features it doesn’t have — like steam, a sanitize setting, moisture sensors, and tons of cycles — is longer than the one detailing those it does have. Still, it’s a solid performer and does present some nice options. There’s a no-heat air fluff setting and wrinkle release, so you can keep your clothes tumbling for 40 extra minutes if you don’t have time to fold them right away. Perhaps the best thing it has going for it is its capacity: 7.0 cubic feet. It’s not as big as mega-capacity options, but that’s still a lot of space for decent-sized loads. Though its base price is $600, we’ve seen it for closer to $450 on sites like Home Depot, which seems more in line with its bare-bones approach. Still, if you’re looking to spend under $500 on a dryer and aren’t interested in bells and whistles, this Maytag might be worth a look. Many people discover the best time to buy a dryer is when their current one starts shaking and clanging then dies mid-cycle. But if you have some advanced warning, it can be beneficial to wait. Many manufacturers start rolling out new products in September or October, meaning retailers want to make room for the new inventory and lower the prices of previous models. However, that’s not a hard-and-fast rule, and stores often have frequent deals coinciding with holidays. It’s not just Black Friday: Memorial Day, Labor Day, President’s Day … You can often find bargains during long weekends. It might behoove you to find out if your local appliance dealer has an annual blowout sale. One located in Seattle, for example, has a yearly sale in early November that draws crowds looking for lower prices. Dryers are a big purchase for anyone, and doing research before purchasing a new appliance is key. If you’ve read our reviews, you may wonder how we reach our conclusions. We like to take into account both benchmarks, like how long it takes to dry clothes and the temperature in the drum, and less objective metrics like design. 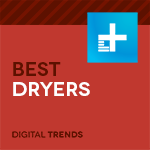 Because our dryers are open for everyone in the Digital Trends office to use, we solicit a lot of feedback from our staffers when considering things like ease of use. This means that we take into account more than just one or two people’s opinions, and it also means the machines go through a fair amount of cycles by the time we’re done with them.